There are many ways to prepare bean salad. The one that I am going to teach you next is very simple, and uses very common ingredients in any home. Feel free to use any other vegetable that you have on hand besides the ones I will mention below. What I recommend is that you keep the dressing very simple always, the lemon and olive oil work perfectly with the beans, you do not need anything else. Of course, wash them and drain well before to use them. Also if you have the precooked beans of the previous day because they are very delicious and will be even cooler. 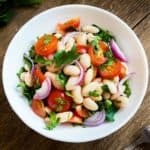 Learn how to prepare a delicious salad Beans step by step with very few ingredients.You choose. Remove the parsley leaves from the stems, get rid of the latter and chop the leaves into pieces small. 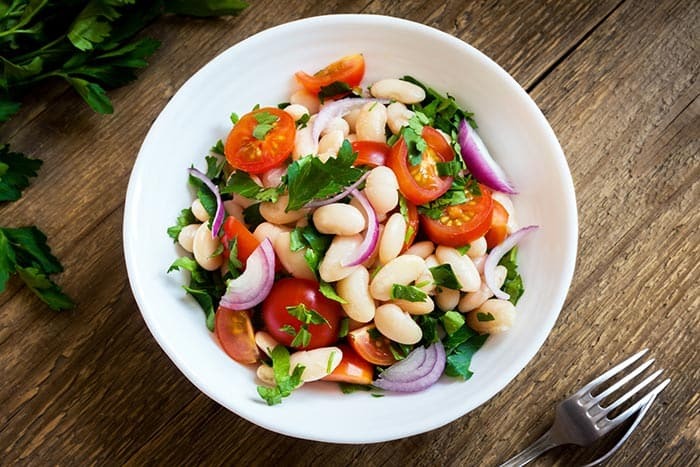 Put the beans, onion and tomatoes in a salad bowl . Put in the refrigerator 15 minutes to cool a bit. Then add salt to taste, a squeeze of lemon also to taste and abundant olive oil. Mix well with the help of a wooden spoon. Just before serving, put the chopped parsley and mix again. In this case the salad includes 1 or 2 boiled eggs and, instead of parsley, fresh lettuce. The other ingredients keep it. The preparation can not be easier: once cooked the eggs, cut them into large pieces, and incorporate them in the bowl with the other ingredients, including lettuce. Similar to the egg version, go back to using lettuce instead of parsley and two cans of tuna in olive oil. Mixes all in the bowl and serve. This recipe works great as a single meal, especially if you are dieting or eating healthy. You can accompany it with wholemeal bread to have a bit of carbohydrates. You can also prepare a soup, or better yet a cream and as a second dish this salad. I recommend a delicious homemade vegetable cream or a cream of mushrooms Very healthy! If you want to use this salad with beans rather as a garnish for a main meal, then the possibilities are huge. This dish is ideal to accompany barbecue or grilled meats or even to serve with rice. We have many more easy and delicious homemade salad recipes that you can prepare on any occasion.